Tofu is marinated in a savory Asian garlic sauce that BOOMS with savory, delicious flavor! An easy dish that’s great with a side of steamed veggies. I love that this dish is so simple, yet booming with flavor. 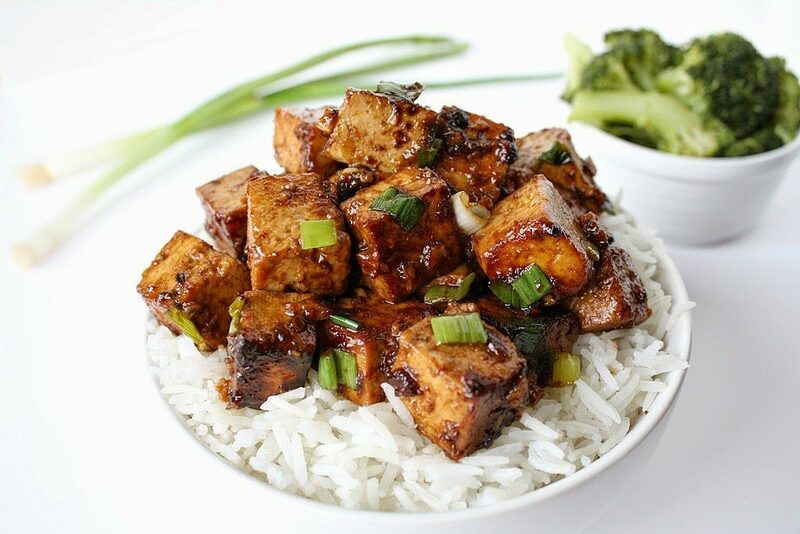 Tofu is marinated in a sticky sweet sauce made with hoisin, garlic, and soy sauce. If you’re not familiar with hoisin, I hope you get familiar! It’s like a thick, flavorful Asian BBQ sauce. (Yes!) The first time I used it was for this Vegetable Lo Mein and knew I had to start working it into more meals. The wonderful flavor and texture is perfect for an easy marinade. I love serving this dish alongside fresh steamed veggies! 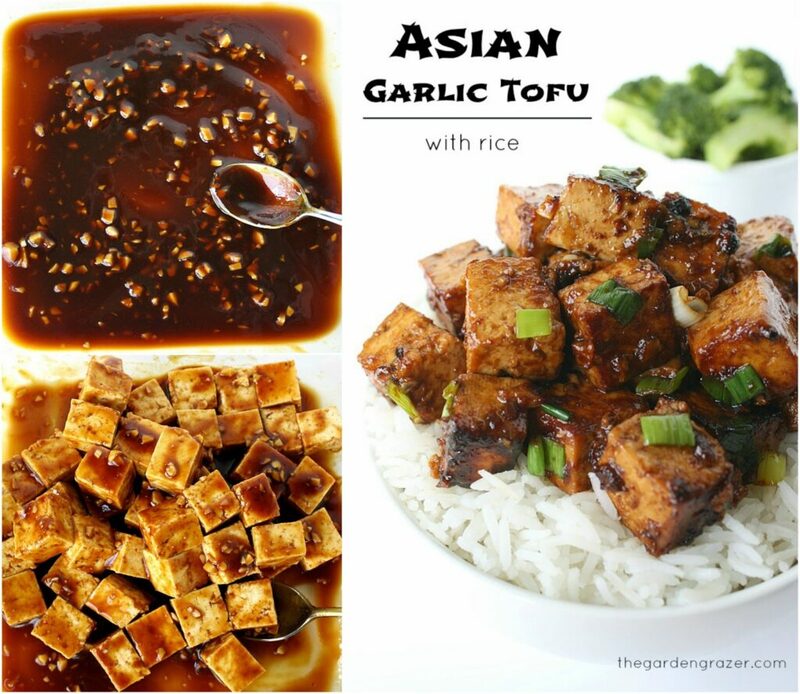 Tofu is marinated in a savory Asian garlic sauce that BOOMS with savory, delicious flavor! An easy dish that's great with a side of steamed veggies. Remove excess moisture from the tofu by gently pressing it between towels. Then cut it into about 1 inch cubes. Mince garlic. Then in a shallow pan, (I use an 8x8" glass baking dish) add the 3 ingredients for the garlic sauce. Stir to combine. Add tofu cubes to the sauce and gently toss until thoroughly coated. Cover and refrigerate to marinate for at least 30 minutes. After tofu marinates and rice is almost finished cooking, begin cooking the tofu: in a skillet, heat 1-2 Tbsp. oil over medium heat. Add the marinated tofu and spread out in a single layer. Cook without stirring for 5 minutes or until browned on one side. Flip them, and cook for another few minutes. 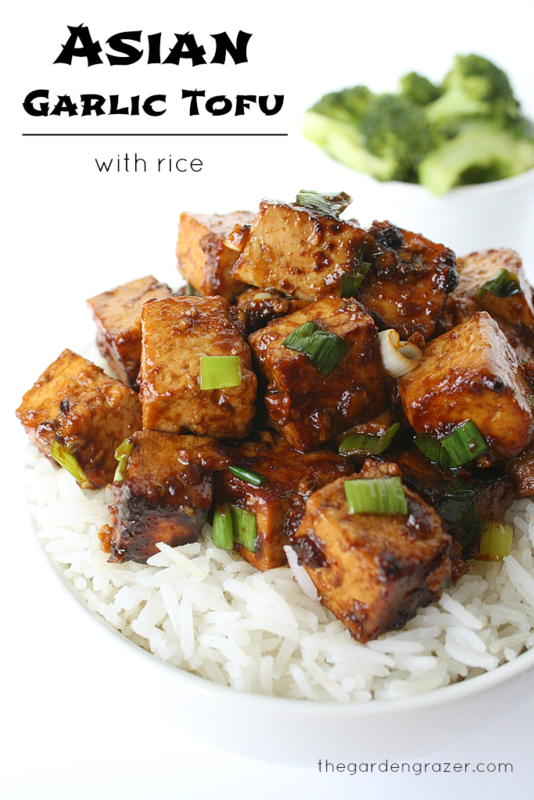 Serve tofu over a hot bed of rice, garnished with sesame seeds or more green onions if desired. For gluten-free: use tamari and a gluten-free hoisin sauce. I use San-J brand hoisin (or Wok Mei also makes a gf hoisin sauce). mmm this is one of my favorite meals!! I've been looking for a new tofu recipe and this sounds really tasty and easy. Great to hear! Hope you enjoy!! Wow, Kaitlin! This looks amazing! I can't wait to try it. I'll be putting it on next week's menu, for sure! Thanks Nichole! 🙂 I hope you guys love it!! Just tried your black bean tacos with avocado dressing, it was DELISH!!!!! Enjoyed them so much better than the meat browned with taco season!!! We also tried Asian Spaghetti very yummy as well!!! I can't express how excited I am that a found your site!!! Thank You Thank You!!!!! Hi Cheryle! Aww, thanks so much for your sweet comments 🙂 So happy you're enjoying some recipes here! I LOVE hearing people get so excited about the site. Hope you continue to enjoy any other recipes you try!! Easy and tasty, just made this for my family, it was a hit! Thank you! 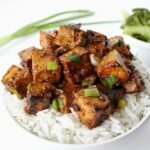 This is one of my all time favorite tofu recipes!! So good!! Thanks! Mine too 🙂 So glad you enjoy it! Was very good… HOWEVER…. It's not gluten free UNLESS u specifically find GF hoisin sauce. Regular has wheat in it. Tamari is always gluten free. Please be careful if u have an allergy!! Thank goodness we caught it before serving. Hi! Thank you so much for your comment, and my apologies for not being more specific about the hoisin in case people didn't know! SO very glad you caught it before serving – yikes! I just updated the recipe, making a note about the hoisin sauce so it's clear for those with allergies. The Wok Mei brand is all natural and gluten-free which is what I recommend. I really need to try making homemade hoisin one of these days!! 🙂 My apologies again and thanks for your comment. Happy to hear you enjoyed the recipe! Hi Jen! Yessss! So excited to see your pic 🙂 I just made a variation of it earlier this week – can't get enough! Hope you love it just as much! Delicious! I have to make this! I just made this for lunch. I doubled the recipe and let the tofu sit in the marinade for about 2 hours. Because of this, there was no extra sauce; only my wife wanted it to be more saucy. VERY easy to make and super delicious. Thanks! Nice Dan!! Glad you enjoyed it! I need to learn from you and double it next time because I never seem to have enough 😉 Have a great week! I've been needing a simple tofu recipe.. (I have yet to make a tofu dish) This looks simple enough! Thanks!! Yay Kate! Hope you enjoy your first tofu cooking experience! I make this one all the time – very simple and flavorful 🙂 Wishing you a lovely week! Thanks for sharing the recipe, it looks moist and delicious! Do the sauce ingredients need to be heated before marinating? Your instructions say to use a shallow pan and stir, but I can't tell if that's over a burner or just to mix the ingredients together cold… Thanks! Hey Rebekah! No heating necessary – I just mix it cold. Super easy! 🙂 Hope you enjoy!! I tried this recipe, but I used rice noodles instead of rice and it was AMAZING!!! Oh but next time I might cut the tofu a little smaller than the recipe says, 1 inch is a bit big for me, but otherwise it was soooooo good!!! Soooo good. I added some finely chopped jalapeños to the mixture and used 1 tbsp of tamari and 1 tbsp of Liquid Amino Acids and oh man. Definitely making this again! Sorry. Quick addendum: I added 1/2 tsp of the Liquid Amino Acids. Making this tomorrow! How many servings does it make? Making this with honey garlic instead but following the rest! Can't wait! Never used tofu before! Hi Ashley! Yay – hope your first tofu cooking experience was a success!! 🙂 Have a great week! Kaitlin I have been trying to add more none animal protien to my meals. This looks delicious but as a diabetic Iam wondering about the carb count. Hi Bridget! Bummer it was too sweet for you, but thanks for your input! Hi Sharon! That's wonderful you're adding more non-animal proteins to your diet. There are so many wonderful foods to play around with, hope you have fun experimenting! Kaitlin, I'm so happy I found your site. 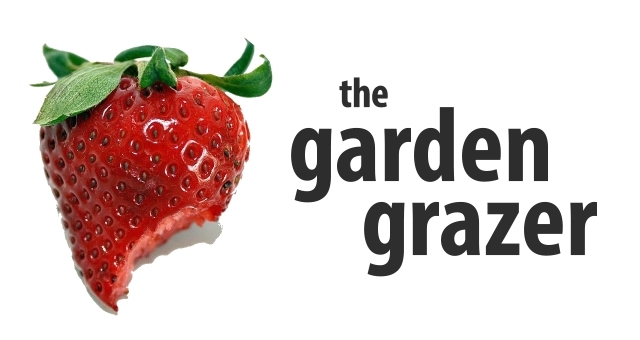 I'm trying to change over to a plant-based diet (pretty much there), and you have some great recipes. I'm going to try this one for Asian Garlic Tofu. I don't have any hoisin sauce, but I have a jar of Lee Kum Kee Char Siu Sauce which it says in parentheses that it is Chinese barbecue sauce. Do you think that would work in place of the hoisin sauce? Hi there, I made this for lunch today and it turned out amazing! I did not expect tofu to have as much flavor as it did. I marinated it overnight and served it with a simple fried rice. Thank you for sharing this recipe. Do you freeze your tofu first? Or CAN you freeze and thaw it first for this recipe? I always freeze and thaw my tofu before cooking because it slightly changes the texture and doesn't fall apart as easily. Your thoughts?? Hey Grace! I've never tried freezing tofu before – but am curious to try it out! Thanks for the tip 🙂 Hope you enjoy the recipe! !